The requirement of surface characteristics on the internal cylindrical ferromagnetic surface without any defects is an important consideration in different manufacturing components like injection barrels, hydraulic cylinders, and bearings. These components are being finished by conventional finishing processes because of their easy availability and lesser manufacturing cost. But the main problem arises during finishing with this solid abrasive tool is the uncontrollable cutting forces during actual finishing cycle. These uncontrollable cutting forces provide various surface defects which result in the reduction in operating life. The formation of high-quality surface finish without any defects is still an important challenged for today’s industry. To counteract these types of circumstances, a new finishing process is developed based on magnetorheological polishing fluid. In the present tool design, the position of magnetic core has been designed to move inside the cylindrical workpiece to finish its internal surface. The inside position of the electromagnetic tool causes maximum magnetic flux gradient at the outer tool surface than the internal cylindrical surface (made of ferromagnetic materials). Thus, the polishing fluid is retained and stiffened magnetically over the surface of the tool only during finishing of the internal surface of the ferromagnetic as well as non-ferromagnetic cylindrical workpieces. From the preliminary experimental results, the surface roughness Ra, Rq, and Rz values are reduced to 60.25, 58.30, and 53.98%, respectively, after 120 min of finishing. This clearly demonstrated that the developed process is capable to improve the surface characteristics of the internal ferromagnetic cylindrical surface by reducing the surface roughness values and removing the various surface defects after the grinding operation. 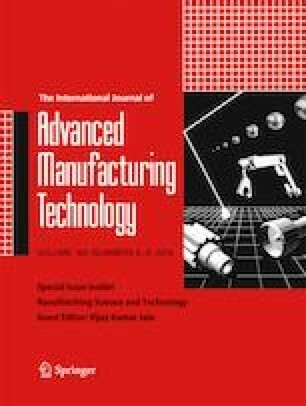 This paper is a revised and expanded version of a paper entitled “A Novel Magnetorheological Fluid Based Honing Process for Superfinishing of Internal Surface of Ferromagnetic Workpiece” presented at 6th International and 27th All India Manufacturing Technology, Design and Research (AIMTDR) Conference, held at College of Engineering, Pune, India, 16–18 December 2016. The authors are thankful to Science and Engineering Research Board (Department of Science and Technology), New Delhi, India, for their financial support (Project no. EMR/2015/000330).